Most presidents generally manage to appoint a cabinet that is largely on the up-and-up. And among those who could not pull off the trick, it was largely one rotten apple that tainted the whole bunch. Buchanan's Secretary of War John B. Floyd, who basically made it as easy as possible for the Confederacy to secede, by scattering government munitions around so they could be captured. Grant's Treasury Secretary George S. Boutwell, who lined his pockets (and then some) during the Crédit Mobilier scandal. Reagan's Defense Secretary Caspar Weinberger, who arranged the illegal sale of arms to Iran. Harding's Secretary of the Interior Albert Bacon Fall, who set up a sweetheart oil deal for tycoons Harry F. Sinclair and Edward L. Doheny. It's going to be pretty tough for future historians to decide which member of Donald Trump's cabinet was the most shady, because there are at least a half a dozen secretaries competing for that honor. In just about any other administration, former HHS Secretary Tom Price, HUD Secretary Ben Carson, former EPA Administrator Scott Pruitt, former AG Jeff Sessions, or Secretary of Education Betsy DeVos would easily take the notoriety crown. In this administration, however, they are just one of the gang. It is really quite fitting that "congregation" can describe a group you might find in a Christian church...or in a swamp. One thing we can say for certain, however, is that Trump has his very own version of Albert Fall in Ryan Zinke. This is yet another interior secretary who tried to use his official position to set up sweetheart oil and land deals for his buddies. The major difference is that Fall's dealings mostly involved oil in Wyoming, while Zinke's involve Montana. So, we're talking places almost 400 miles apart (Teapot Dome, WY to Bozeman, MT, as the crow flies). It would appear that Zinke pushed his luck a little too far, however, because he's out of a job at the end of the year. The Secretary insisted that he is innocent of all the charges that have been made against him, and that all the evidence thereof is fake news, but explained that he just doesn't have the time, money, and energy to defend himself. The truth, however, is that Zinke did such a poor job of covering his tracks that he would be the easiest of easy targets for investigations by the incoming Democratic House. The Trump administration does not need to leave the blue team with a free throw to get started, so Zinke was advised to resign or else he would be fired. It was Chief of Staff John Kelly who reportedly swung the ax; that is presumably the last time. From now on "Mick the Knife" Mulvaney, the incoming acting chief of staff, will wield the axe. Slowly but surely, Republicans and Democrats are moving toward a consensus that a do-over of the House election in NC-09 will be necessary. The chicanery that was undertaken in order to score a razor-thin victory for Republican Mark Harris was so obvious and so dubious that a bipartisan elections board (4 Republicans, 4 Democrats, 1 Independent) has thrice refused to certify the results. It may seem, then, that the bad news for Harris is that he's going to have to run another campaign, and try to win the election legitimately this time. But it's actually worse than that for him. This week, it was revealed that the would-be Congressman was directly involved with the hiring of "dirty tricks" operative McCrae Dowless, who was responsible for most of the illegal activity that took place. This hire was made despite the fact that Dowless is a convicted felon, and that Harris was warned repeatedly against using his "services." Last week, a 7-year-old girl from Guatemala was taken into custody by the Border Patrol. She said she was not feeling well, but did not get medical attention until she started having seizures 8 hours later. By then, her body temperature was at 105.7 degrees, in large part because she had gone multiple days without food or water. She was taken to a hospital, but it was too late, and she died of exhaustion and dehydration. "We're going to get to the bottom of this"
"It's a real tragedy, and we hope her family will be all right"
It was the last one, as you might have guessed, which is entirely consistent with an administration that never admits fault, and that generally sees the lives of people who are not white and/or not American as being considerably less valuable than those of people who are white and American (i.e., the base). Charles and David Koch have been big-time Republican movers and shakers for several decades; the amount of money that they and their network of donors has dumped on the GOP totals in the billions of dollars. In just the last cycle, in fact, they set aside $400 million (though it's not clear they spent all of it, since final figures are not in yet). However, the 2018 cycle could well mark the beginning of the end for the Kochs' outsized influence on the Republican Party, for a trio of reasons. The first is that the GOP's move in a populist direction has moved it pretty far away from the libertarian sensibilities of the Kochs and many of their supporters. In particular, the Kochs do not approve of tariffs and trade wars, or of the Trump administration's policies on immigration. Meanwhile, the GOP may struggle to hang on to two of the Kochs' bread-and-butter issues, namely cutting taxes on the rich and global-warming denial, for much longer, given the way political currents are trending. The second reason is that the long-time leaders of the Koch network are nearing the ends of their runs. The two billionaires who founded it and led it for nearly 30 years, Charles and David, are not exactly spring chickens. The 78-year-old David is in poor health and, at risk of being indelicate, is suffering from several issues that mean he may not make it to the next election. Charles, at 83, is in better health, but is still slowing down. And that leads us to the third and final reason: The brothers' heir apparent, 41-year-old Chase Koch. While Chase shares the libertarian sensibilities of his father (Charles) and uncle (David), he does not really share their interest in advancing their goals through the political process. He's much more interested in philanthropy and innovation, and to the extent that he gets involved in politics, it's mostly programs and initiatives that might attract bipartisan support. In other words, Chase Koch is something of a right-leaning Bill Gates. Speaking of emblems of a past incarnation of the Republican Party, The Weekly Standard announced this week that it is shutting down. Its last issue, in fact, will be released tomorrow. We're running out of frontrunners, or near-frontrunners, which means we may soon have to start examining the merits of Oprah Winfrey or The Rock. Today, however, it's one of the final top-tier candidates we haven't gotten to. Background: A lifelong Minnesotan, Klobuchar's mother was a teacher and her father was a sportswriter. Her home life was not always great, however, particularly in her teen years due to her father being an alcoholic (as Justice Brett Kavanaugh reminded us during his confirmation hearings), and was often absent (either due to work, or drunkenness, or both), eventually culminating in a divorce. The resulting trauma took a major toll on Klobuchar's sister, who dropped out of high school and spent much of the next decade drifting and directionless. Klobuchar managed to persevere, however, and was valedictorian of her high school class before matriculating at Yale, where she received a B.A. in political science, and then at the University of Chicago law school, where she took her J.D. in 1985. She then spent the next decade in private practice while also marrying and starting a family. Political Experience: Klobuchar's first involvement with politics was somewhat inadvertent. When she gave birth to her daughter, she was forced to leave the hospital within 24 hours, despite the fact that there were complications that meant the infant could not swallow properly. She appeared before the Minnesota state legislature to lobby (successfully) for a bill establishing a 48-hour minimum. This, in turn, led Bill Clinton to impose that requirement nationally. In her first actual election, in 1994, Klobuchar ran for County Attorney of Hennepin County (Minnesota's largest county by population; it includes Minneapolis). However, she dropped out when incumbent Michael Freeman pulled a Marco Rubio and decided to stand for reelection at the last minute after having announced he would not do so. Four years later, however, Freeman stepped down and stuck with it, and so Klobuchar was elected. She served two terms in that job before running for, and winning, her seat in the U.S. Senate in 2006, thus becoming the first woman elected to represent Minnesota in the upper chamber of Congress. She has since been twice reelected, both times in landslides (35 points in 2012, 25 points in 2018). Signature Issue(s): Klobuchar is a remarkably effective Senator, and in several of her years in the Senate, she has gotten more bills passed into law than any of her colleagues. Her committee memberships also speak to the diversity of her interests and expertise: She's served on the Senate committees on the Judiciary; Commerce, Science and Transportation; Agriculture, Nutrition and Forestry; and Rules and Administration; and on the Joint Committees on Economics, on Printing, and on the Library. That said, the issue that she is most identified with in her home state is probably infrastructure. That has been an area of interest since her college days, when she wrote her undergraduate thesis about the construction of the Hubert H. Humphrey Metrodome. She has been remarkably successful at rallying support and funding for improvements and repairs to infrastructure in the Gopher State, perhaps most obviously when the I-35W bridge collapsed into the Mississippi River. Her website lays out her views on this issue, which the Senator describes as "the bipartisan job creator rural America needs." Instructive Quote: "Courage means standing next to someone you don't always agree with for the betterment of the country." Completely Trivial Fact: Although Klobuchar's former colleague Al Franken is the Minnesota politician famous for his career in comedy, she's no slouch in this area, having been a very well reviewed member of the improv group "Suddenly Susan" during her undergrad years. Recent News: Doing what she does best, Klobuchar got a bill passed by Congress this week—unanimously in both chambers. This one overhauls the legislature's policies regarding sexual harassment among its own ranks, and now heads to Donald Trump for his signature. Assuming he signs it, it will be the 99th Klobuchar-sponsored bill to become law. That's a very impressive total, a rate of about eight bills-turned-laws per year in a body where two or three a year is considered a pretty good clip. 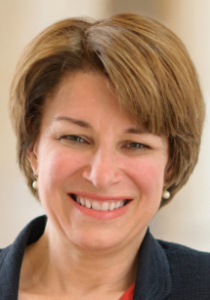 Three Biggest Pros: (1) Coming from Minnesota, she's focused a lot on rural voters' issues—that is to say, the folks who feel the Democratic Party has left them behind; (2) If voters want a politician who reaches across the aisle and gets things done, that describes Klobuchar better than just about anyone in the Democratic field; and (3) When speaking to voters, she's one of the most likable people in Washington, by all accounts (although her colleagues tend to find her a little off-putting). Three Biggest Cons: (1) The young and urban voters that make up the bulk of the modern Democratic Party may struggle to get excited about Klobuchar and the issues that matter most to her; (2) She's been a very effective campaigner in Minnesota, but her hands-on approach may not be scalable; and (3) Some worry that she is a little too nice, given how ugly 2020 figures to be. Is She Actually Running? : She says she's "thinking about it," which is politician-speak for "yes." Betting Odds: She's got a wider spread than just about anyone, with some books at 20-to-1, others as low as 7-to-2. That implies a 5%-23% chance of claiming the nomination. The Bottom Line: She is one of the Democrats' stronger candidates, and has the advantage of flying under the radar at the moment. That means she's not being put under a microscope right now in the way that, say, Beto O'Rourke is. In other words, she's well-positioned to peak at the right moment, if she can heighten her national profile just a bit more. If you have a question about politics, civics, history, etc. you would like us to answer, click here for submission instructions and previous Q & A's. If you spot any typos or other errors on the site that we should fix, please let us know at corrections@electoral-vote.com. Dec14 Will More Republicans Retire in 2020? Dec12 Stay President To Stay out of Prison? Dec11 Trump Calls Hush-Money Payments "A Simple Private Transaction"